This image is licensed under a Creative Commons Attribution-NonCommercial 4.0 International License. Over 1,000 posts on the Getty Iris are now free to use under a Creative Commons attribution license. This means you’re invited to copy, remix, and adapt the text of our posts for any reason—personal, academic, or commercial—as long as you include a link back to the original post and follow the other license terms. Creative Commons licensing is an international set of legal tools, supported by the nonprofit organization of the same name, that helps copyright owners proactively share materials in a clear, easy-to-use way. 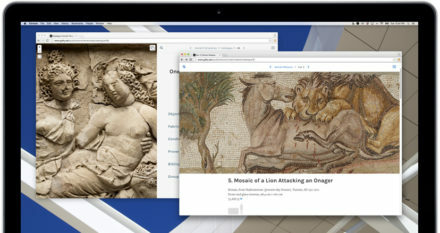 The blog joins other Getty resources released under Creative Commons in the last few months, including text on the Getty Museum’s online collection pages and in digital collection catalogues from Getty Publications—as well as more resources that will be released in the coming months. 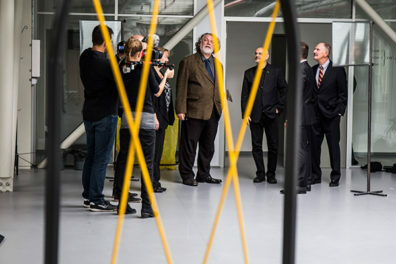 This move to Creative Commons licensing is part of the Getty’s commitment to the free sharing of information and images launched in 2013 with our Open Content Program. Starting this summer we’ll also start marking images on the Iris as CC-BY, CC-BY-NC, or all rights reserved so it’s easy to tell which images can be used, too. Creative Commons licensing is part of a collection of improvements to The Iris that launched today and will grow throughout the summer. The blog has a cleaner design that we hope makes for a more pleasant browsing and reading experience. We’ve stripped away visual clutter, such as multi-level navigation and sidebars (blogroll, month-by-month post lists, and so on). Using insights gleaned through user interviews and card sorts, we’ve also reduced our topic scheme from an unmanageable 25 to a tidy 5 that encapsulate the range of content on The Iris: Art & Archives, Conservation, People & Places, Scholarship, and Technology. There’s also a new Audio & Video section with snackable media, a list of Series (branded columns), and a subscribe by email feature. The Iris team at work. 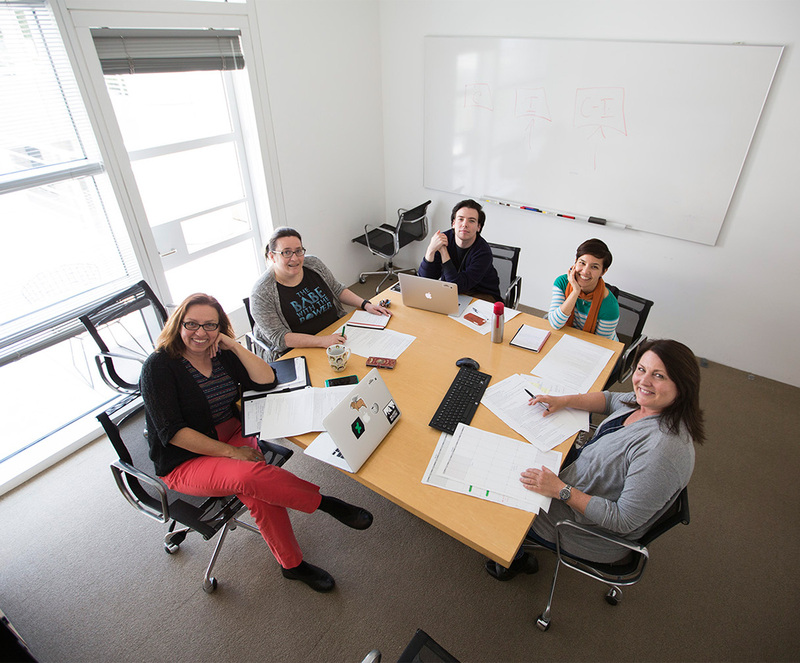 Clockwise from bottom left: me, web developer Paula Carlson, social media producer Tristan Bravinder, web content strategist Amelia Wong, and project manager Diana Carroll. This image is licensed under a Creative Commons Attribution-NonCommercial 4.0 International License. 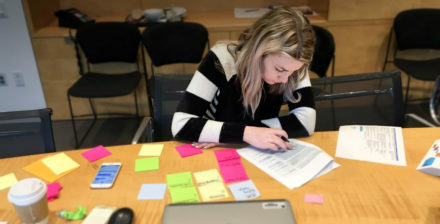 Designing and rebuilding the blog took a small team in the Getty’s Web Group about five months, but we started the process of rethinking it a year ago. We looked at what the blog was doing well and poorly, and whether we still needed it in the first place. Through group brainstorms, one-on-one conversations, and reader feedback via online survey, we became convinced that our blog—and museum blogs in general—have an important role in highlighting staff and community voices, telling lesser-known stories, and providing a place for conversation. That’s why we’ve recommitted to The Iris as a blog (no longer an “online magazine”). We’ll refocus our efforts on behind-the-scenes views and stories from the Getty community, and prize authenticity and spontaneity over polish. We’re still working on several features—such as a better print layout and a tool to customize the frequency of subscription emails—that will roll out over the next few months. We’ll also be retrofitting some of our most-read archived posts with bigger images to reflect our new design. Now as always, we’d love to hear what you like and what you don’t about how The Iris looks, functions, and reads. Does no one proof your work? I used to do that for a large corporate law firm and I have to say, this material needs one more set of eyes. Great achievement otherwise. Hi Jill, Thanks for posting this comment as it prompted me to reread the text and find and correct a handful of typos—including a few that had been spotted by our eagle-eyed head of publications and flagged to me—that didn’t make it into the final published post. This was my error. I’m also glad you noted this as it gives me an opportunity to share how content on The Iris is developed, which may be of interest for anyone considering repurposing it under Creative Commons licensing. 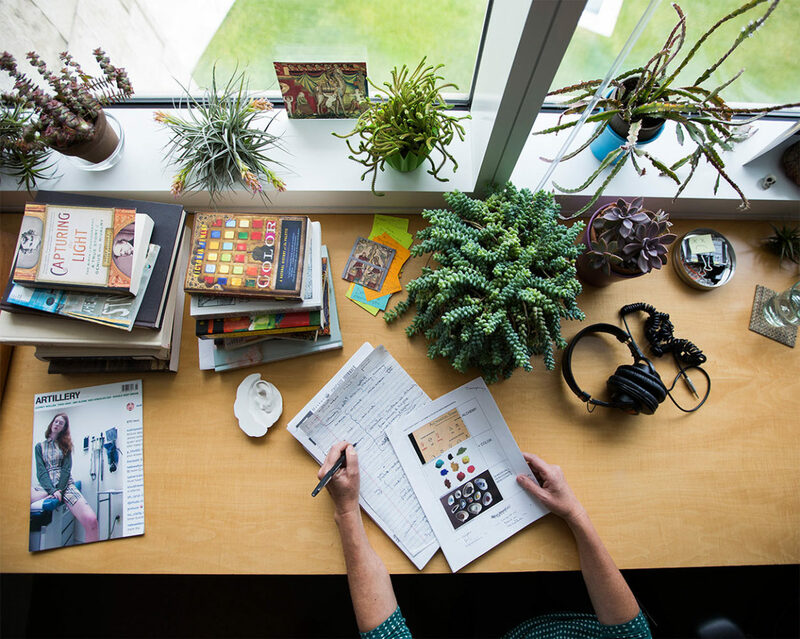 Content is written by members of the Getty community including staff, visiting scholars, interns, volunteers, docents, guest lecturers, and sometimes other outside contributors, including freelance writers. Writers are often subject matter experts on the topic at hand. When they are not, their text is reviewed before publishing by at least one subject matter expert to make sure that facts are correct. Posts are also edited by one or sometimes two editors, who perform fact-checking, copyediting, and formatting for house style. Lively writing is important to us, but never at the expense of accuracy. All that said, blog posts go through fewer rounds of review than print material, such as books or exhibition texts. We prioritize velocity over perfection. Editing errors shouldn’t ever creep through, but it’s a fact of the web that they sometimes do. When that happens we correct them as soon as they are noticed—and we’re grateful to readers who care enough to keep us on our toes. Congrats! I love the new layout and topic list. P.S. I also love the phrase “snackable”…just putting that out there. Thanks Krystal—I hope our content will be snackable yet nutritious! Would you please explain what CC-BY, CC-BY-NC stand for and what exactly they mean? I’ve never heard those terms before. Thanks so much. Hi Hannah, Thanks for your question! These are abbreviations for Creative Commons licenses. CC BY is shorthand for a license that allows someone to use content for either noncommercial or commercial purposes, as long as they provide attribution (“BY”). CC BY-NC is shorthand for a license that allows someone to use content for noncommercial (NC) purposes only, as long as they provide attribution (“BY”). Creative Commons offers more detail on the six various licenses (as well as public domain tools) on their website here.